Go see Arthur if you like funny, entertaining films. If you don’t like funny, entertaining films or don’t like Russel Brand please don’t. It would be easy to be dismissive of another pointless remake starring pseudo controversial, too big for his boots Russel Brand but that would be wrong. When I first heard Russel Brand would be in a remake of Arthur I didn’t believe it and wrote it off as a buzz engineered rumour, but did think – wouldn’t that be great? That’s the role Russel Brand was born for. I barely remember Dudley Moore and Sir John Gielgud’s 1981 Arthur but do know that I enjoyed it, well as much as a kid could enjoy a film about a hilarious wisecracking tragic alcoholic enjoying an extended adolescence. Arthur is careful to stay the right side of clever, without letting itself meander into territory that invites comparisons to the original. But if I had to make one unwarranted comparison between Russel Brand’s Arthur and Dudley Moore’s Arthur it would be that Dudley Moore is a more convincing drunk. As with the original Arthur concerns Arthur a billionaire that after one public embarrassment too many is given an ultimatum – he must either marry the decidedly unlikeable Susan (Jennifer Garner) and settle down or lose his inheritance – hilarity ensues when he falls for Naomi (Greta Gerwig) and has to decide on following his heart and losing his carefree world. I absolutely loved Arthur and was giggling the entire way through it. The laughs are well balanced with a touch of emotion. Russel Brand is spot on as the otherworldly yet vulnerable man child Arthur. Arthur is a well crafted film that plays well to Russel Brand’s strengths. But the real magic of Arthur is the dynamics of the relationship between Brand’s Arthur and his nanny Hobson, played by Helen Mirren. I have to say Mirren is in every fourth film these days (which is a good thing) but rarely is she given the scope and screen time to allow her character to breathe as in Arthur. Mirren would have stolen the show from the considerable flash made from Brand had it not been for Luis Guzmán as Bitterman - Arthur’s straight man and chauffeur. Every scene he is in will leave you with a smile. As an example the opening scenes of Arthur are particularly funny as Arthur and Bitterman dress up as a duo of fairly convincing Batman & Robin apart from Robin's suit being about 4 sizes too small (then drive around the streets of New York in the Batmobile). Frickin hilarious! Arthur never plays it just for laughs and keeps at least one foot lightly planted in the emotional side of things. 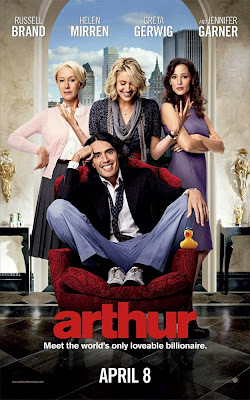 If you are looking for a hilarious light hearted romp with some heart Arthur is the film for you.